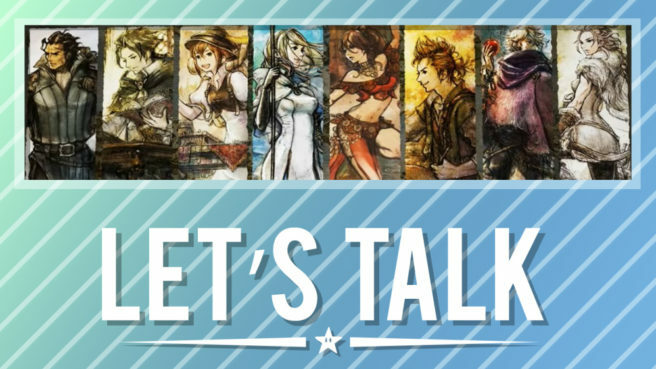 [Let’s Talk] Did the new demo sell you on Octopath Traveler? Switch has a big, exclusive RPG launching in July. Of course, we’re referring to Octopath Traveler. Despite being a couple of weeks off, you can experience a big chunk of the game as we speak. During E3, Nintendo and Square Enix added a new demo to the eShop that lets you play through three full hours. How many of you have had a chance to play through the new demo? Did it sell you on the game? Perhaps you were already sold after seeing the initial reveal last year or trying the previous demo? Let us know how you’re feeling about Octopath Traveler in the comments below. Personally i liked Nintendo’s E3 but it’s not advertising the games I want. We got Tennis, Party and Smash coming this year, which are all great multiplayer titles, but I’m still waiting for the next big singleplayer title. Below expectations only because they delayed 2 games out of 2018, FE and Yoshi and announced Smash’s release for the end of the year. 10 months of this year are ports, 3rd party games that you can get anywhere else for $20 or are always on sale for dirt cheap, a couple of B level Nintendo franchises and LABO. Next year will probably be really good though and the Switch will sell well – but man did they finally just halt their momentum. If you’d asked me immediately after the Direct, I’d have said it was a great show. I love Smash, and my biggest character inclusion hope going in was “as few cuts as possible” (because I like playing Lucina and Robin and lots of other characters who felt very expendable). And seeing everyone return, including past cuts who haven’t been in it for a while was amazing. I literally cried, and I’ve watched the Everyone is Here trailer like a dozen times since. I’m beyond hype for this game. But taking Smash out of the equation and looking at the rest of the Direct on it’s own, it leaves a lot to be desired. Like, the rest of the highlights for the show to me were Xenoblade 2’s DLC and the new Fire Emblem’s first reveal. The latter unfortunately being joined by a far pushed back release window that we were originally quoted. I’m sure it’ll be worth the wait, but my heart sank a little when “Spring 2019” came up. Along the same lines, I really felt Yoshi’s absence too. Super Mario Party looks neat. I hesitate to say I’m EXCITED, but I’m happy with what’s been shown of it so far. And Daemon x Machina looked interesting (if a very confusing way to open the show that made me think it was Xenoblade X2 going in a very artistically different direction). And while I don’t care about Fortnite or Overcooked, I’m looking forward to sitting down with Hollow Knight. In my opinion, the direct was a bit disappointing. Last year had so many surprises compared to this year. Not many games that showed up were for me. Fire Emblem impressed me, but nothing else grabbed my attention. Smash taking up such a huge portion of the presentation listing every single character and providing tidbits of information was not what I wanted to see. They could have just started with “Everyone is here,” and saved so much time. No new modes were teased, or features unique to the Switch. I can only hope that there’s more to it. Gameplay looks solid though. I would have liked to see some turn based rpgs on the switch. The 3ds library has some of my favorite jrpgs after having a slow start. I’m just hoping atlus has an amazing presentation in the future for switch or 3ds stuff. I personally enjoyed the Direct, but I can totally understand people who don’t like Smash not liking it. I think that there should have been more of an emphasis on all the upcoming Switch games this year as only a small percentage were even covered in the really short section on upcoming games, which left the impression for many who don’t follow these things too closely that the Switch hasn’t got many games in the pipeline.